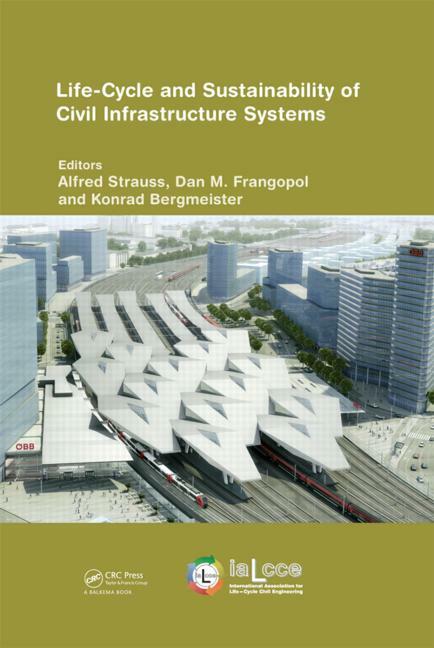 Life-Cycle and Sustainability of Civil Infrastructure Systems contains the lectures and papers presented at the Third International Symposium on Life-Cycle Civil Engineering (IALCCE 2012) held in one of Vienna’s most famous venues, the Hofburg Palace, October 3rd-6th, 2012. This volume consists of a book of extended abstracts (516 pp) and a DVD-ROM with 344 full papers (2515 pp) presented at IALCCE 2012, including the Fazlur R. Khan Lecture, 10 Keynote Lectures, and 333 Technical Papers from 52 countries. All major aspects of life-cycle civil engineering are addressed, including aging of structures, deterioration modeling, durable materials, earthquake and accidental loadings, sustainability, fatigue and damage, structure-environment interaction, design for durability, failure analysis and risk prevention, lifetime structural optimization, long-term performance analysis, performance-based design, service life prediction, time-variant reliability, uncertainty modeling, damage identification, field testing, health monitoring, inspection and evaluation, maintenance strategies, rehabilitation techniques, strengthening and repair, structural integrity, decisionmaking processes, human factors in life-cycle engineering, life-cycle cost models, project management, lifetime risk analysis and optimization, whole life costing, artificial intelligence methods, bridges and viaducts, high rise buildings, offshore structures, precast systems, runway and highway pavements, tunnels and underground structures. practitioners from all areas of engineering and industry. Has sustainability become the norm in the planning and execution of building projects? Epoxy-coated reinforcement – optimization of life-cycle costs?